One of the easiest classes of roses to grow is the rugosa rose. Rugosas are low maintenance, with great cold tolerance and pest resistance. Most rugosa roses are tall, shrubby, sprawling, multi-branched plants that need plenty of room to spread out. Many are fragrant, produce colorful "hips" and have an abundance of vicious thorns. Be sure to plant them where you won’t be backing into them and use extreme caution moving a large rugosa rose. Although beautiful and rugged, rugosa roses are starting to become naturalized in non-native areas and could potentially become a nuisance or even invasive. 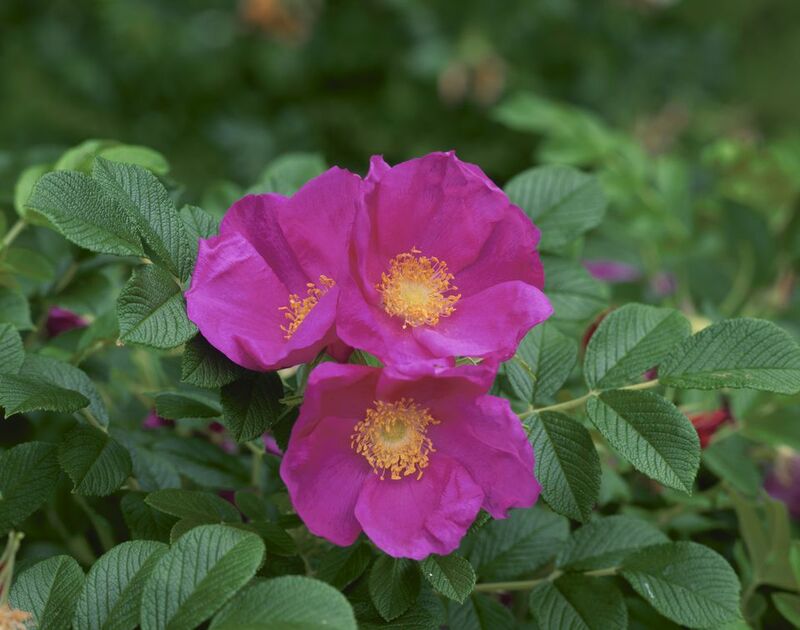 Check with your local Department of Environmental Conservation before adding rugosa roses to your landscape. Mature Size: Rugosa roses are large, sprawling plants. They will easily reach 4 to 8 feet high and 4 to 6 feet wide. Rugosas are known as rugged roses because they can be virtually maintenance free. They can handle less than ideal growing conditions, including light shade, salt air, frigid temperatures, drought, and high humidity. The Latin name Rugosa means "wrinkled" and refers specifically to the crinkled, serrated leaves with pronounced veins. Rugosa rose leaves occur in leaflets of 5 to 7 leaves. The rose flowers were often single (a circle of petals with a center disk), but double flowers have been hybridized and tend to be only about 2 to 3 inches wide. Many have a slight to strong clove fragrance. If you have a large cottage border, a Rugosa rose will make a nice back of the border plant or focal point. Note that Rugosa roses will engulf a small garden. A better bet would be to plant a single rose where it can lean against a structure, like a split rail fence. Use caution planting near entry areas and walkways. The canes will bend when heavy with flowers and the thorns will reach out and grab you. Rugosa roses bloom in late spring to early summer. Many varieties will repeat bloom, but the initial flush of bloom in late spring will be the strongest. As with most roses, rugosas will need a spot in full sun to partial shade. You will get the most blooms in full sun. Rugosa roses prefer a rich, well-draining soil with slight acidity of around 5.6 to 6.5 soil pH. The Rugosa roses are very forgiving and can tolerate poor soil, clay, and all kinds of abuse. Rugosas roses establish best if planted in the spring and are kept well watered through their first growing season. They also prefer an area where there is little competition from weeds and nearby plants. These plants are very hardy and can survive a variety of temperatures. They do not need humidity to thrive. Unless your soil is very poor, your Rugosa rose shouldn't need a lot of supplemental feeding. A slow release, complete fertilizer in the spring should suffice. Some varieties have a sensitivity to chemical fertilizers and seem to fare better if they are watered well before feeding. "F.J. Grootendorst": This variety produces clusters of cranberry red flowers. "Hansa"': These grow as double, fragrant lavender-pink flowers and orange hips. "Henry Hudson": This type is a smaller growing variety with white flowers. "Sandy": This variety is eco-friendly since it was developed specifically for sand dune stabilization. How much to prune Rugosa roses depends on how large you want them to be. You can prune them to almost ground level in the spring if you want to keep it small, or you can do minimal pruning of old wood and suckers if you want a large, natural looking bush. To encourage new growth and keep the plant full, it helps to prune at least 3 to 10 inches from the tips in spring. As with all roses, don’t prune if a frost is anticipated within six weeks, to avoid winter dieback. If you don’t deadhead the flowers, you will get wonderful rose hips in the fall that will persist through winter. The rose hips are similar to their cousins, the crab apple. They are high in vitamin C and can be used for teas, jams, and jellies. Some varieties will send out suckers that run and spread. Removing the suckers early will keep the shrub from becoming a nuisance. Rugosa is lower maintenance than other rose species, but it is a rose and it can be susceptible to the usual diseases, like black spot and stem canker. Black spot fungus infects the roses when the leaf surface is wet. If you prune the surrounding vegetation, this will enable better air movement in the garden. It is not immune to attacks from Japanese beetles, aphids, and borers. The aphids and borers are more of an annoyance and won't kill the rose plant. To treat the roses, rinse the plant with the garden hose and then apply insecticidal soap or horticultural oil. Japanese beetles can cause damage and should be removed when spotted. Use an insecticide like Neem Oil to kill the beetles and prevent them from laying their eggs.